28.05.2017. The fact that classic male professions are becoming increasingly exciting for young women is reflected year after year in Germany’s “Girls’ Day” event. Every year, around 100,000 schoolgirls make use of the day to get a taste of professions that are still dominated by men. In the Friedhelm Loh Group, 37 girls were able to gain an insight into technical and IT careers again this year. The aim of the project is for them to get to know potential training occupations so that they could make their career choices as impartially as possible. Working in a nursery school or with animals – these are the answers many girls still give when asked about their dream jobs. There are probably not that many young women who would refer to the production environment or software engineering when it comes to their professional aspirations. Yet the fact that they are increasingly turning towards such careers is shown by the nationwide “Girls’ Day” event. Every year, around 100,000 schoolgirls take part to gain an insight into industrial occupations still dominated by men. This year, more girls than ever took part in the Friedhelm Loh Group’s event: at Rittal and Eplan, thirtyseven schoolgirls were able to get a feel for working in training occupations in technology, industry and IT. 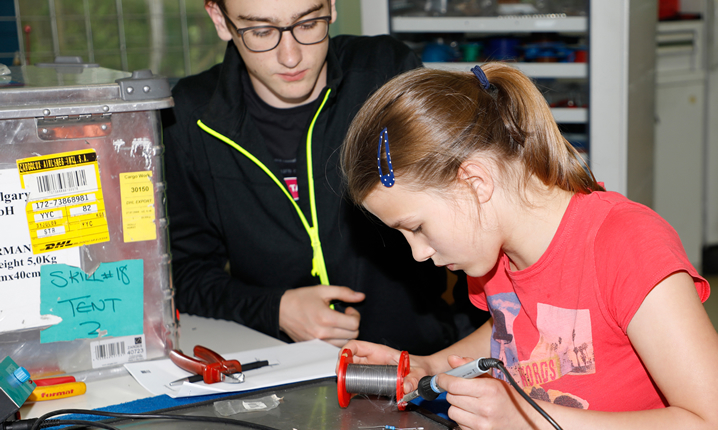 “It’s a lot of fun to be able to try out so many new things here”: That was is the verdict of 12-year-old Luise Kaut involved in setting up a basic electrical circuit and gaining hands-on experience. It had been a good choice to spend Girls’ Day at Rittal, she felt. In the training workshop at the Rittal plant in Wissenbach, Luise, along with 16 other school students, leaned some of the technical details of production work at the manufacturer of modular enclosure systems. Guided by Rittal trainees, they soldered together LED figures at a number of workplaces or set up pneumatic circuits, for example. Moreover, the trainees introduced the young visitors to the company's technical and industrial training occupations: technical product design, in particular, made a very big impression. At the Monheim am Rhein and Stuttgart locations of Eplan, the software specialist of the Friedhelm Loh Group, a total of 20 girls also got to know about IT and commercial training occupations, as well as about work in a software company. For example, the pupils in Monheim were given a playful introduction to the world of programming: With just a few clicks on selected words, they were able to write an “endless story” in a short time – because the programming language running in the background automatically formed linguistically correct sentences. Girls’ Day is a tradition in the Friedhelm Loh Group, because the family business places great emphasis on discovering young talent: For more than ten years now, the group has been opening its doors to interested female pupils and showing that they, too, can find an exciting place in industrial and IT professions. Currently, the Friedhelm Loh Group is training 200 young people in 20 different professions. In addition, there a further 50 students are taking eleven different StudiumPlus degree courses, completing their studies within the group and at the Central Hesse University of Applied Sciences (THM). When the girls were asked about which occupation they would later want to pursue, the answers were already different than had been expected at the end of the try-out day: “I still don't know what I want to be doing later on,” said Luise – though a career that she found out about at the Rittal Girls' Day would definitely be an option. Image: The schoolgirls soldering LED figures at the Rittal plant in Wissenbach, under the guidance of Rittal trainees.